Ms Julie Das, District Coordinating officer and a seed producing farmer discuss the distinct features of Devi variety. Farmers are taking up seed production of Devi (ICGV 91114), the early-maturing and drought tolerant variety of groundnut in a big way. The foundation seed and certified seed production of this variety was taken up in 564 ha during the 2015-16 postrainy season. The seed production program involved over 1000 farmers across four districts (Nuapada, Bolangir, Kalahandi and Ganjam). The farmers get an additional income of Rs 8000 (US$119) per ha, considering an average yield of 800 kg per ha. To meet the seed requirement, the project envisages production of 750 tons of certified groundnut seeds every year in 2015-16, 2016-17 and 2017-18 through the seed farmers. The project, designed to be farmer-driven, farmer-implemented, and farmer-owned, has trained farmers to be seed producers and strengthen the system to ensure access of quality seeds to the smallholder farmers. 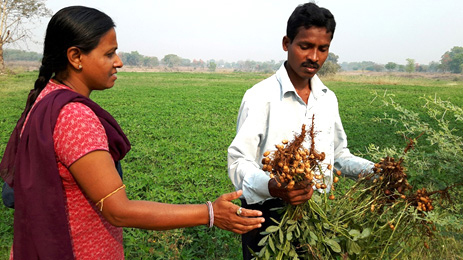 Seed producing farmers were trained to distinguish the pod features of Devi from other groundnut varieties and adopt good management practices. During the 2015 rainy season, 217 tons of seed of different classes, foundation seed, certified seed and truthfully labelled seeds of Devi variety were produced by the farmers of the state. In the process, farmers have learnt to maintain genetic purity of the variety and seed certification procedures. 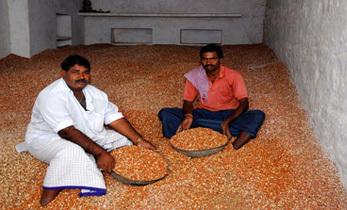 Odisha State Seed Certification Limited (OSSCL) has procured about 54 tons of certified seed from the project’s seed producing farmers to distribute to other farmers in the subsequent season. The remaining seeds went to the next stage of seed production in 2015-16 postrainy season and farmer-to-farmer sharing. 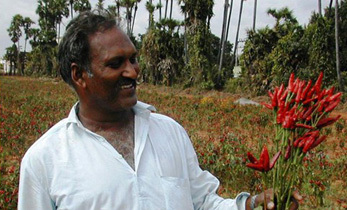 Enterprising farmers and small seed traders produce the truthfully labelled seeds and they are released in public domain. 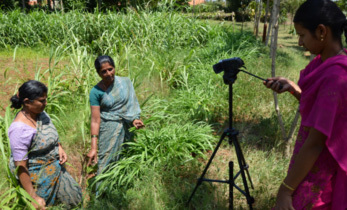 During her visit to the seed production plots, Dr P Janila, Senior Scientist, Groundnut Breeding, ICRISAT, found it interesting that farmers were able to remember the distinct pod shape of Devi, and had given it the name ‘nakko-beki’, meaning ‘nose and neck’ in the local language. The pods of this variety are bold with shallow constriction and small beak, while the off-types, in general, have medium constriction with prominent beak and small pods. 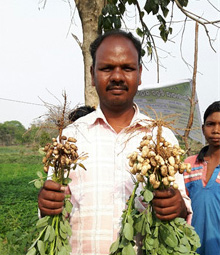 The state of Odisha is sixth in India in terms of groundnut production. 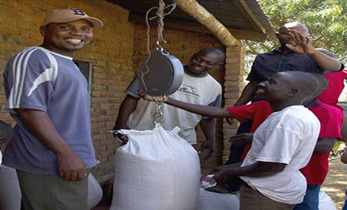 However, availability of quality seeds is a major problem for the smallholder farmers, forcing them to save their own seeds year after year or to get it from other farmers. 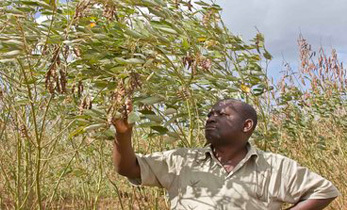 Approximately 80-90% seeds are sourced largely from farmers’ saved seeds resulting in poor yields. 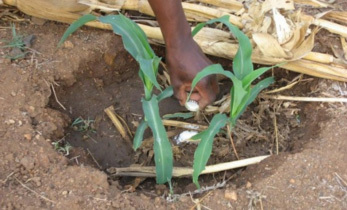 Changing the situation required the development and replication of seed production and delivery systems, which will give farmers access to adapted, stress-tolerant, highly productive and market-preferred cultivars. Project: Scaling-up of improved groundnut varieties through established seed system in various cropping systems of smallholder farmers in Odisha.